Whether you are a business user, a functional consultant, a User Experience Lead, a developer, or a basis expert, if you are working with SAP S/4HANA (or SAP S/4HANA Cloud) at some point you will want to either set defaults for your own user id or show others how to do it. This blog explains how to set user defaults, and what user defaults are currently delivered by SAP. You will also find links to other blogs on the prerequisites needed for SAP S/4HANA, i.e. how to complete the once-off activation for user defaults, and how to apply user defaults to both classic user interfaces, SAP Fiori apps, and your own custom Fiori apps. SAP delivers a large and growing list of default values that you can use as parameters for delivered SAP Fiori apps. Authorizations to use these default values are provided in delivered Business Roles. And in delivered SAP Business Catalogs, default values are also applied to set the parameters of SAP S/4HANA apps. 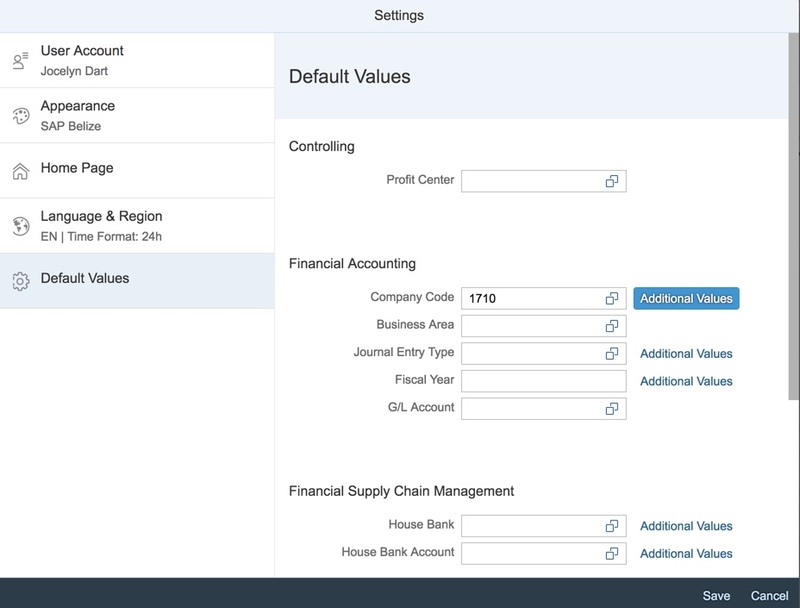 You can also use these default values for your own custom business roles, business catalogs, and custom Fiori apps. Many apps use default values for setting defaults in apps. In this example, the default value Company Code has been used to set the Company Code value in SAP Fiori app Post Incoming Payments. Many apps can use multiple default values for setting filters in apps. 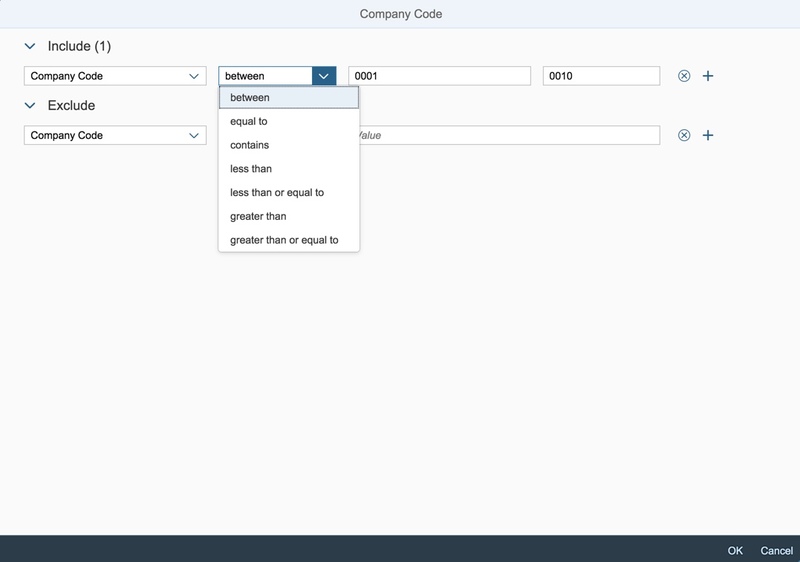 In this example, multiple default values for Company Code are used to set the filter value for Company Code in SAP Fiori app Manage Journal Entries. NOTE: Some parameters allow you to specify additional values. You can click Additional Values to add values to the parameter. When you are in Default Values, you can tell if Additional Values have been set already. If Additional Values are set, the Additional Values link is emphasized. You can see Additional Values have been set for Company Code in the example below. Any changes or updates you make to Default Values will automatically be applied to all apps that use those default values. These are the currently available default values delivered by SAP as at September 2018 including those used in SAP S/4HANA Cloud 1808 and SAP S/4HANA 1809. 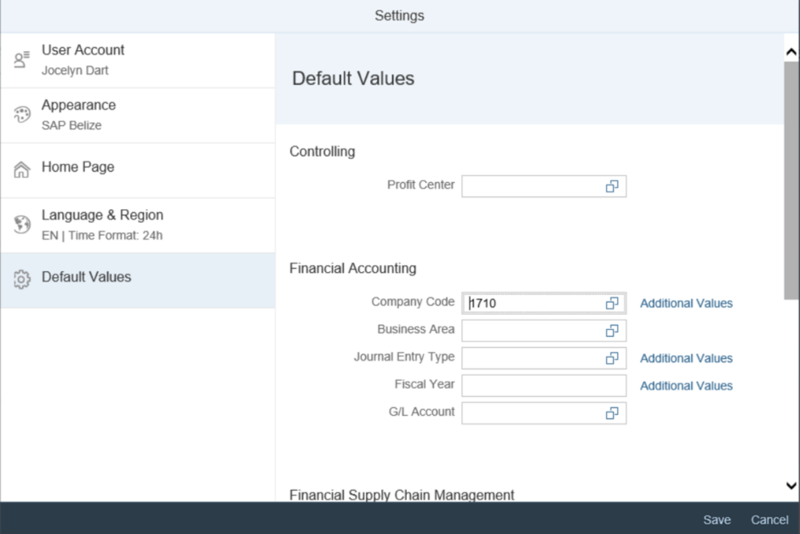 Your SAP S/4HANA version – while the User Defaults technique has been around for some time, as new SAP Fiori apps are added, new default values are created. Just like any other SAP Fiori app, Default Values needs a once-off activation in your SAP S/4HANA system. Typically this is activation is done by your User Experience Lead or basis expert. You can find out how to do this in Activating User Defaults in SAP S/4HANA. You also need to be authorized to set default values so that Default Values appears in your Settings. This is part of your business role. SAP delivers these authorizations in many of the SAP S/4HANA sample business roles. If you don’t see the Default Values contact your security administrator. If they are not sure what is needed, you can also find out what is needed in Activating User Defaults in SAP S/4HANA. Finally the default value needs to be applied to the app’s parameters. This is usually managed by your User Experience Lead or your Launchpad Content Administrator or your basis expert. You can find out what is needed in Applying User Defaults in SAP S/4HANA, including how to set user defaults for others as an administrator. Brought to you by the S/4HANA RIG with special thanks to Jorge Baltazar who did a lot of the legwork on this one. Thank you for this informative blog! I checked note 2519765 and while it mentions that synchronization from Fiori default values to backend SET/GET parameters is possible, it does not list any steps or corrections. Do you know where more information is available? We get the “No value could be determined for variable /ERP/P_0FISCVARNT01” error which is not very indicative of the actual issue: That parameter ID CAC needs to be set in the backend. This is described in note 2530566. Since users only have access to the Fiori default values and not the backend t-code SU3 this means that our user admins have to assign the parameter ID as part of user setup which is not a great solution. The once-off updates from SET/GET parameters to default values is automatic. There’s no steps or corrections needed. You don’t mention where you are getting the error? Please raise the “No values could be determined” error as a SAP Incident “Enhancement Request” – it would be better if the value was passed from DefaultValues if possible but that will depend on the input parameters available. Since this involves a BW report unfortunately that’s outside of my expertise. could you solve the issue with CAC ID and “No value could be determined for variable /ERP/P_0FISCVARNT01” error? We have the same issue with Fiori Web Dynpro Apps. Sorry for the late reply! Hopefully you noticed above that our solution to that error was to set parameter ID CAC (controlling area) in the backend system on each individual user’s ID. thank you for the answer! We have already this parameter in the backend for each user, but unfortunately the same issue. We have a requirement to enhance the standard fiori app for purchasing approval. This enhance will provide a filter in order to locate the correct requisition. In order to do that, the business area require that we have a default value so he does not have to fill this new filter every time. The customer wants to user the User Default Value, as explained in the link bellow, but its only availible to S4HANA. We are using SAP Fiori Cloud with Odata Provisioning and a connection with a ECC On Premise (EHP4). Do you have any comments about it? The problem is mainly that under the covers these are written using new techniques so don’t downgrade to Business Suite. So unfortunately that means looking at what extensibility options that specific app provides. Your answer clarify what were our options. Is it a way to add user defaults for multiple users at a time? I have about 350 users and need to assign the same default values for all users. Just wondering if this can be achieved? There is some work happening behind the scenes on providing such a capability in future. For now however our best advice is to set up the SET/GET parameters with your initial default values and use the procedure described in SAP Note 2519765 – Synchronization of Fiori User Default Values with Backend SET-/GET-Parameters to synchronize them.